For the past three years, whilst not travelling the world fulfilling his hands on role as Clipper Race Chairman, Sir Robin Knox-Johnston has spent the bulk of his waking hours painstakingly and personally restoring his long-term passion project, Suhaili. This week, more than half a century after being built in Bombay, India, one of the most famous yachts in sailing history has been refitted and relaunched alongside the latest two generations of his Clipper Race fleet. Sir Robin first made history in 1969 when he won the Sunday Times Golden Globe Race on board his 32-foot Bermudan ketch Suhaili, setting the record as the first man to sail solo, non-stop around the world, thus kicking off an incredible career during which further racing records, multiple yachtsman of the year accolades, a knighthood, patronages of sailing organisations all around the world, and twenty years of inspiring amateur sailors to follow his experience, have followed. Sailing Today Deputy Editor Emma Bamford, who took part in the 2009-10 edition of the Clipper Race as a media berther for The Independent, went to visit Sir Robin as he prepared to relaunch his well-loved ‘companion’ (the English definition of the word Suhaili). The following is an extract from her feature article. 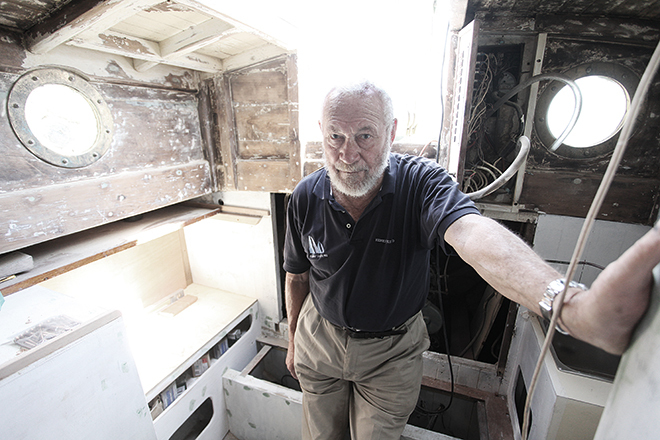 SIR ROBIN KNOX-JOHNSTON is going cruising again. 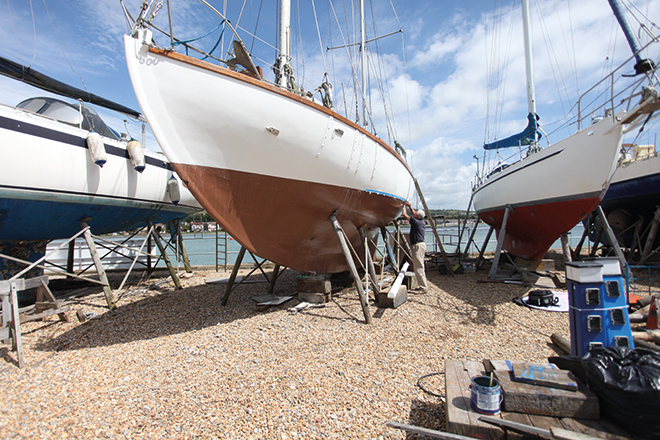 He tells Emma Bamford about restoring Suhaili – and plans for a perfect cruising boat. From the ground, divested of her sails and bowsprit, the 32ft long-keeler looks like any other old boat on the hard of any yard – brick-red antifouling, fresh coat of white paint on her topsides, stripe of peeling blue masking tape between. It is only when you look closely at her owner – dressed as many a British yacht owner in faded polo T-shirt and paint-spattered deck shoes – that the identity of this boat becomes apparent. This is Suhaili, the first boat to ever circumnavigate the world non-stop; and this is her owner, Sir Robin Knox-Johnston. It is remarkable to think that such a doyen of the sailing world would be in the yard, getting grubby working on his boat. Isn’t Suhaili a national treasure, for one, protected for the nation, like the Cutty Sark or Mary Rose, in the purified air of a museum somewhere? For a while she was: the 32ft bermudan-rigged, teak-built ketch (44ft length over spars) went on display at the National Maritime Museum Greenwich in 1997 but her planking started to shrink in the controlled atmosphere so Robin removed her in 2002. For the past three years she has been on the hard of a Solent boatyard, slowly being restored back to her former glory – note, not modernised, but restored – ready for her owner to take her cruising again. “I’m sanding by hand!” comes the replying shout from inside the boat by Ralph, 16 – who certainly has enough dust covering him to prove it. Suhaili is the only boat that Robin owns now, although he is contemplating buying another (we’ll come to that later). He and a couple of friends built her in the early 1960s in a Bombay dockyard. “It took foreeever,” he says, stretching out the word to add emphasis. 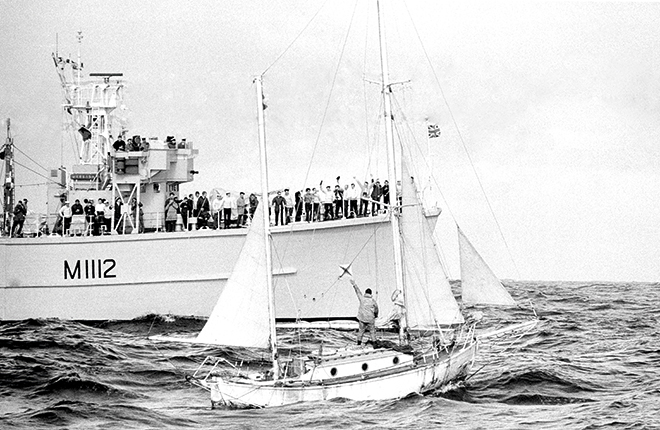 Her keel was laid in 1963 and she was finished in 1965, and sailed first, with a crew of three, comprising his brother Christopher and Heinz Fingerhut, to South Africa. Then, after her skipper took a break to earn some much-needed cash in Durban by stevedoring and captaining a trading coaster, the trio sailed her to Britain. Following his groundbreaking circumnavigation in the Sunday Times-sponsored Golden Globe race in 1968/9 she would go on to be cruised quietly by Knox-Johnston through the 1970s and 1980s. 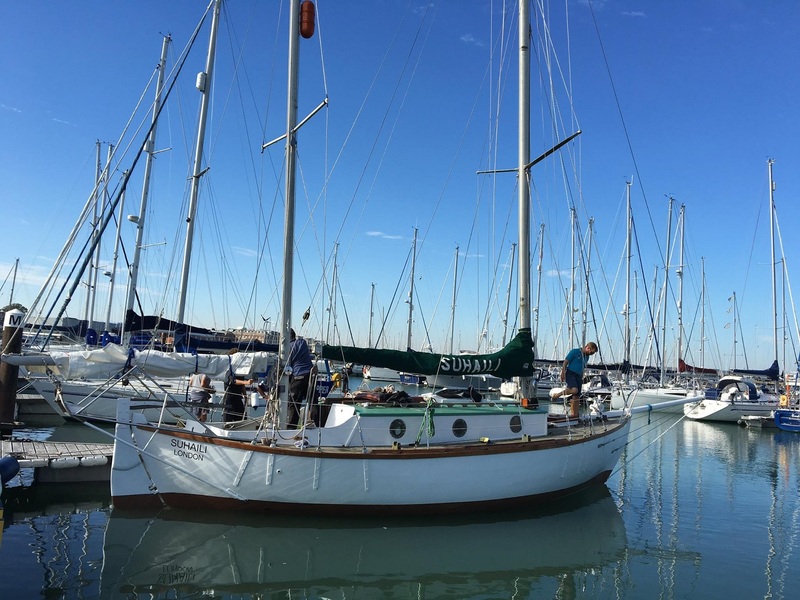 And now she’s back in the yard, being put into tip-top condition ready for the start of the Golden Globe Race 2018, the event being held to mark the 50th anniversary of what Robin acknowledges is probably his biggest achievement – being the first person to sail solo non-stop around the world. I’m not using journalistic licence when I say that you wouldn’t know, looking up at her on her stand on the hard, what this yacht was. It is only when we climb up the ladder that we see how dated she is. The cockpit, by today’s standards of cruising boats, is remarkably exposed. There’s a flat teak deck, with a square pit in the centre, deep enough for sitting. There is no protective coaming, no sprayhood, no steadying grab-rail within easy reach of the helm. Click here to read Emma’s full article. Sir Robin and Suhaili’s return to racing will take place later this month when they compete in the Hamble Classic Regatta, 24 - 25 September. The anniversary Golden Globe Race will take place on June 14 2018, organised to mark exactly 50 years since he set off on his record setting voyage. 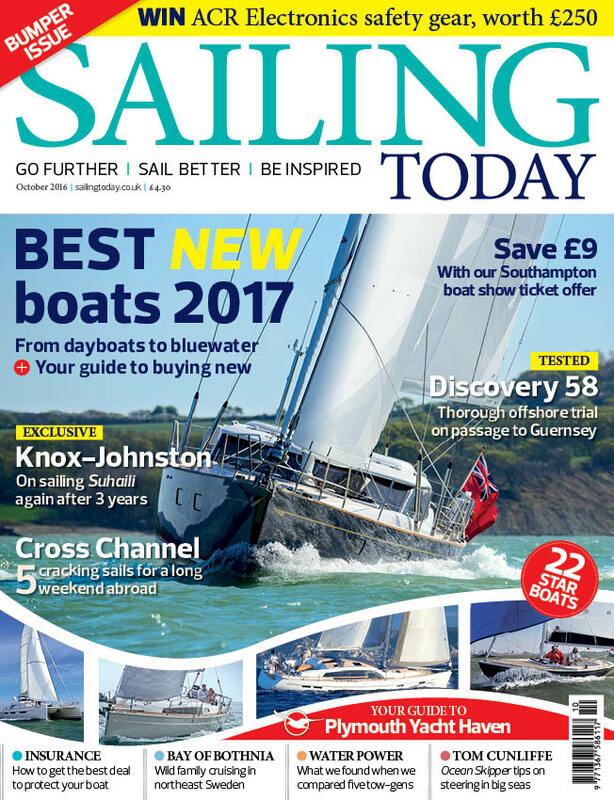 In contrast to the current professional world of elite ocean racing, this edition plans to replicate the technology and equipment which were available to Sir Robin at the time, known now as the ‘Golden Age’ of solo sailing. So far the race organisers have confirmed three Suhaili replicas are in build or planning phase, and 26 provisional entries have been named so far.